Providing you the best range of dry ice making machines, dry ice storage boxes and snow maker with effective & timely delivery. Weight 7 - 8 kgs. 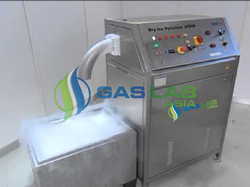 There are different types of machines used to make dry ice in different forms. We can make dry ice in cylindrical form, tablet form or in pallet form. Given below are the dimensions of cylindrical form only. Dimensions:Top Dia	15 cms (6 inches)Length	23 cms (9 to 12 inches)Temp. of the cake	-800cTime required to make a cake	30 seconds Weight	7 - 8 kgs. Dry Ice Making Machines comes in different capacities. 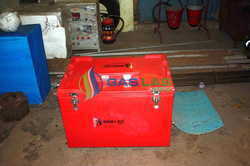 PU insulated with fiber glass body, these dry ice storage boxes ensure minimum evaporation. Quite sturdy for transportation. For the production of CO2 snow in laboratories.